Comments are a great way to keep your users engaged and build a strong community around your content. Tiny hacks like comment redirect help you improve user experience and stand out. 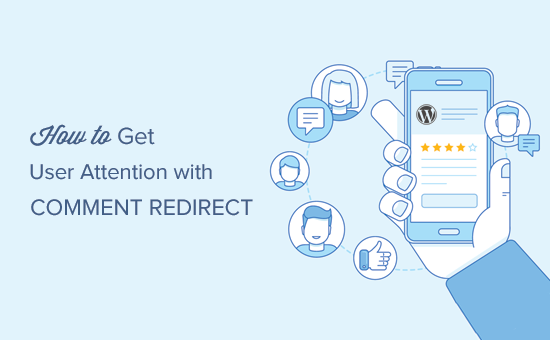 In this article, we will show you how to easily redirect user’s attention with comment redirect in WordPress. First thing you need to do is install and activate the Yoast Comment Hacks plugin. For more details, see our step by step guide on how to install a WordPress plugin. Upon activation, you need to visit Settings » Comment Hacks page to configure plugin settings. Yoast Comment Hacks plugin is a combination of many useful hacks to improve the default WordPress comment system. 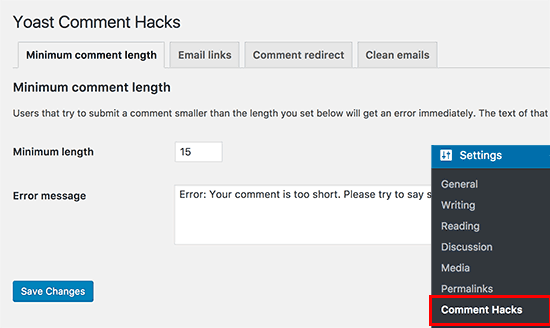 See our guide on how to install and setup Yoast Comment Hacks for WordPress to learn about all its features. Right now we will focus on the comment redirect feature in the plugin. Go ahead and click on the ‘Comment Redirect’ tab on the settings page. Here you need to select a page where you want your first time commenters to be redirected to. 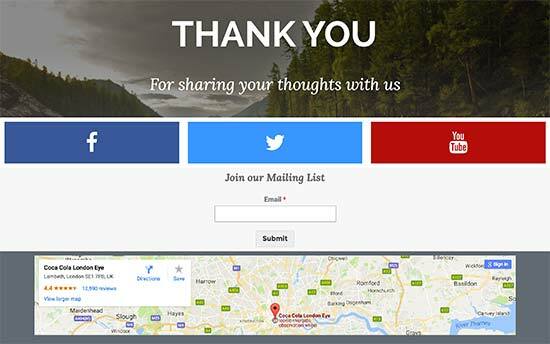 This could be a simple thank you page with an email signup form, social media links, and your most popular posts. You can also redirect users to a landing page, special offer, or a specific lead magnet page. After selecting your page, don’t forget to click on the save changes button to store your settings. To see the comment redirect in action, you will need to logout of your WordPress site first. After that go to any post on your website and leave a comment using a random name and email address. You will be automatically redirected to your selected page when you submit the comment. Yoast Comment Hacks only redirects first time commenters. This means you only get one shot at converting those users and leaving a meaningful impression. 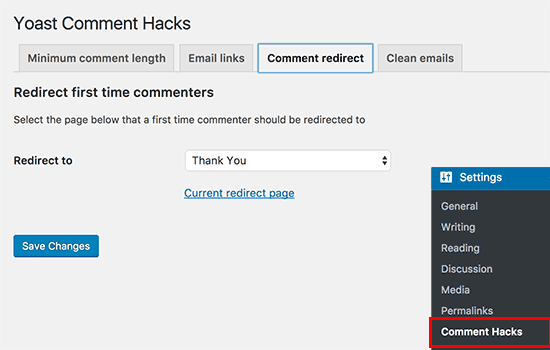 Here are some tips on creating a powerful comment redirect page. You can create a beautiful custom page using a drag and drop page builder plugin. We recommend using Beaver Builder which comes with several ready to use page templates that will work perfectly for this purpose. You also need to set a goal for your comment redirect page. This goal could be any task you would like to see the user perform. For example, buying a product, signing up for your email list, following you on social media, etc. You can use OptinMonster to capture those leads. It is the best lead generation software that helps you convert abandoning visitors into subscribers and customers. 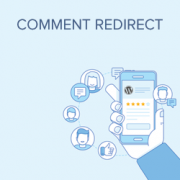 We hope this article helped you learn how to redirect your user’s attention with comment redirect in WordPress. You may also want to see these actionable tips to drive traffic to your WordPress site. Hello. Si there’s a way to redirect just for the first comment with a snippets?